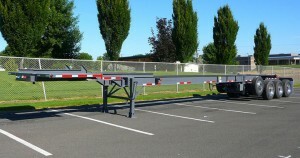 DBNSL-3415 Super Chassis Three Axle Chassis with drop axle on slider handles (one) 40′ container. • MAIN FRAME: 12” Manufactured I Beam Structural Grade. • TONGUE: 10” Manufactured I Beam Structural Grade. • KING PIN: 2” X 3/8” Bolster on ¼” Plate. • SLIDER: 10” Manufactured I Beam Structural Grade, ¼” Formed Cross Members. • SUSPENSION: Huchens 9700 Series Three Axle 49″ Spread. • AXLES: 77.5” Track, 5/8” Wall, Cast Hub Pilot Hubs, Cast Drums, “Q” Series 16.5″ x 7″ Brake shoes, 30-30 Spring Brake Chambers, Gunite Auto Slack Adjusters. • ELECTRICAL: JKD 7 Wier Sealed Harness, Sealco Sealed ABS Harness. • LIGHTS: 4” JKD (9) LED Tail Lights, 2″ LED JKD Bee Hive Marker Lights, DOT Approbed 1 1/2″ & 2″ Conspicuity Tape. • PRIMER: PPG Two Part 400, 401 Epoxy Primer. • PAINT: Sherman Williams Polyurethane Top Coat. • Optional Decal Package with Tailer Numbers and Tare Weight.